Here are the details of Bossy E bingo. In phonics, a "bossy E" (also known as a "magic E" or a "silent E") is an E that turns a previous vowel into a long vowel, For example, in the word "cake", the bossy E at the end of the word, makes the A into a long vowel, This particular phonics game is designed to practise such words. Each student is given a bingo card or bingo worksheet containing a different random selection of bossy E words, and a marker pen (or set of counters). Here are some free printables for playing Bossy E bingo. They include a call sheet (for the teacher or parent to use for bingo calls), and a set of 8 bingo cards to give to the students. Try introducing Bossy E words containing a consonant digraph such as "blame", "flame", "space" or "stone". Try introducing longer Bossy E words such "complete" or "supreme". When applicable, try reading out words without the final bossy E as clues, and ask what the Bossy E would turn them into, for example, "If you add an 'E' to 'kit', what would it become?" (Answer: "kite"). You could even make a variation of the game using only such words. Try rhyming bingo: For example, if the teacher says "make", students can mark off "cake" from their bingo cards. 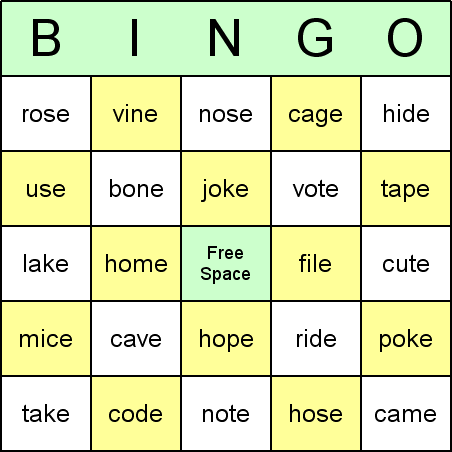 This variation works best if you prepare bingo cards that contain only one or a few possible rhymes for each clue. 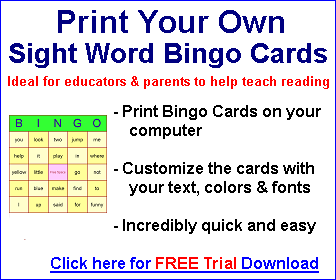 The Bossy E bingo printables on this web site were produced using the registered version of the Bingo Card Printer software. You could easily make your own bingo games using the same method. You can download the settings file bingo_bossy_e.bcp by clicking here. Save the file to a folder of your choice on computer.